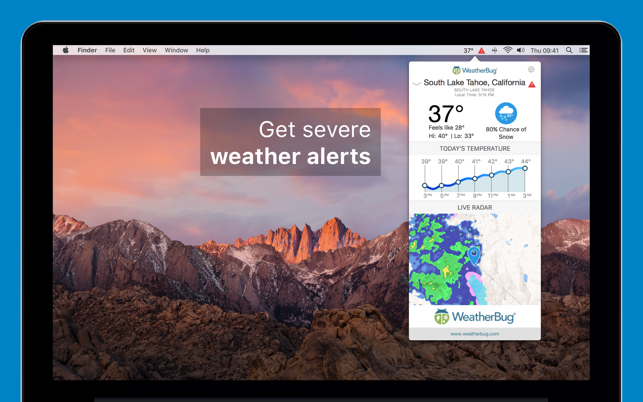 Get all the weather information you need straight from your menu bar with WeatherBug! 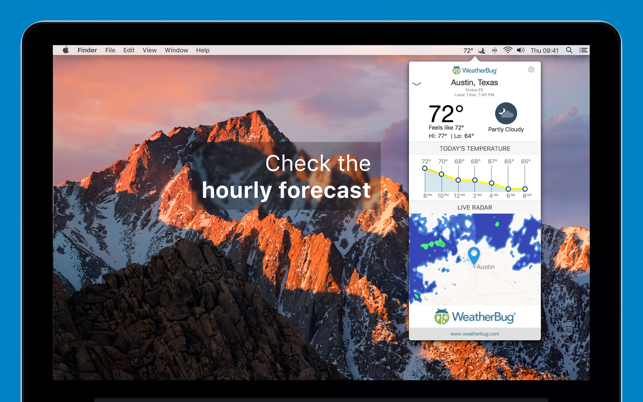 See real-time weather conditions, get severe weather alerts, check the hourly forecast, and see a live radar view for all your favorite locations. 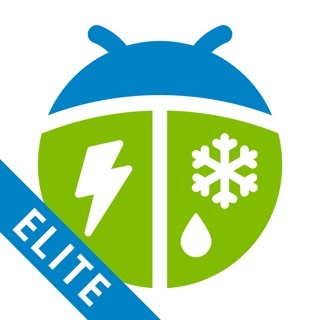 Download the weather app powered by the largest professional weather network in the world! Our weather network delivers the fastest alerts and the best real-time forecasts. Be prepared. Know Before™. Download WeatherBug for your Mac today! • Menu bar getting too crowded? Now you can decide how much weather you want to see. Check out our new settings to see our new menu bar icons. 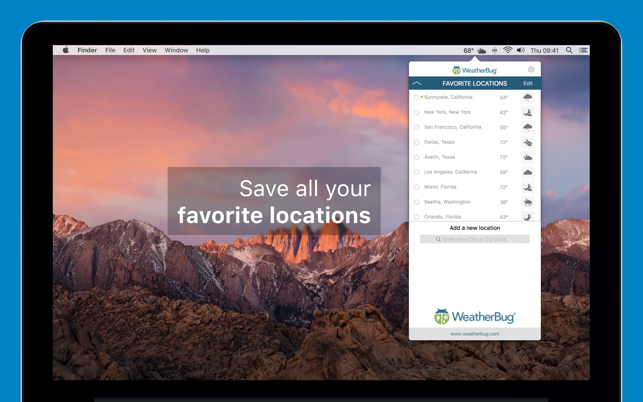 Send us your ideas on how to make WeatherBug even better to feedback@weatherbug.com. Loved the app till today. Worked great, great for finding out what was happening outside before going out. Great for finding out the current weather. Liked the fact that one could access the app and THEN if one wanted too, access the web site with all their adds. Tried it a while ago, where the map should have been, were choices which directed one to their web site. Do not want that feature. The tool bar click was great, gave one what they wanted. The web site is good, just as add heavy as the Weather Channel, but this app gave a instant convienience others do not give. Sent the app to the trash after downloading it again, the current version is the problem. Will consider again if map is returned to normal. I liked Weatherbug because I could get what I wanted. When I needed more, I went to the web site with all the adds. Weatherbug app was a better choice because one could miss out on all the adds and videos, one could just get the weather. Ok, Let’s start off be saying it is not as great for the Mac as the PC. But, It works wonderful and smooth. The features it has for a free app is WONDERFUL ! The weather is accurate, it has every location available, the radar works great and it shows you the temp on your menu bar without clicking on it ! Most apps charge for that feature. Yes there are ads. Like every free app. Hopefully that will change when they come out with their upgrade app for a fee. I don’t get what the negative rating reviewers are saying. I have it installed on 3 of my MACS. No problems. Maybe they are running old MAC os’s or something. Oh well. All I know is Weatherbug seems like a good app to me. I’ve had Weatherbug on my desktop for years, but since I’ve upgraded from my 5 year-old iMac to a new one, the App won’t stay in the Status Bar Menu. It may be there for a while, and then it disappears. I have the App on my iPad and iPhone — it works ghreat there. Unfortunately, when the App is in the Status Bar Menu, and I want to get more detailed information, clicking on the App sends me to the Weatherbug webpage, which doesn’t seem to display the information as well as the Apps on the smaller devices. It’s almost impossible to find the wind direction and speed from the Weatherbug web page. I’m scouting for another weather App.